This project is about providing a bicycle and pedestrian connection between two major trails and the Bruce Vento Nature Sanctuary. It requires bridging over 4 lanes of Warner Road and over 200 feet of railroad Right-of-way. 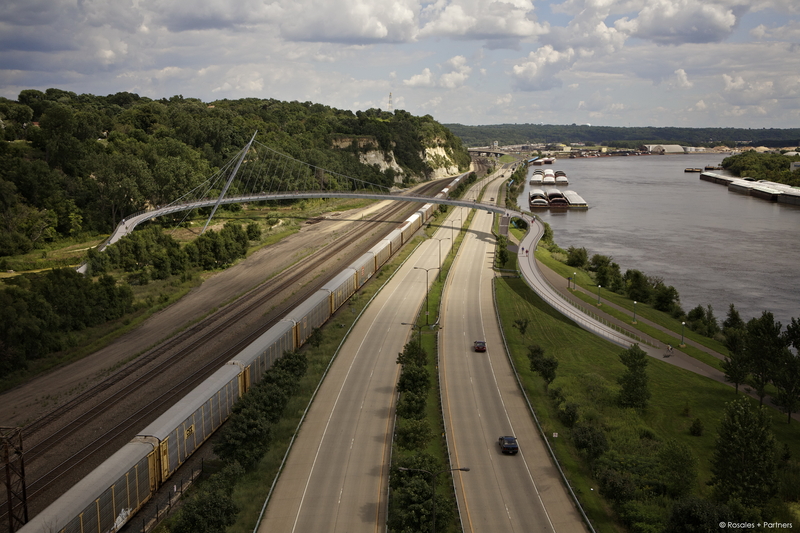 The importance of the connection as well as recognition of the obstacles limiting access for St. Paul’s eastside community led to the allocation of Federal funds for design and preliminary engineering of a bridge to complete the connection. Project priorities were established in a series of design workshops with public involvement beginning in 2009. The most important factors in the connection were safety, protection of the views of the bluff, minimizing impacts on the Bruce Vento Nature Sanctuary and recognition of the Dakota sacred place known as Wakan Tipi, also known as Carver’s Cave. These goals were complicated by the inherent physical constraints on the site which included height restrictions imposed by Holman Field airport, the presence of a conservation easement within the sanctuary, and road and railroad clearance needs including allowing for proposed future expansion including a high speed passenger rail line and a rail ‘flyover’ to connect to the Union Depot. The bridge design firm of Rosales + Partners together with Westwood Professional Services devised a bridge solution that settles comfortably within the site’s many constraints and provides a sculptural counter to the complex urban infrastructure that surrounds the restored natural community of the sanctuary. The design was well received when it was presented at a public open house in October of 2011 and from that point, additional preliminary engineering has continued. The proposed design has been submitted to the Federal Aviation Administration (FAA) and the BNSF and CP railroads for their review. There has been nothing in their reviews to date that has suggested the project is incompatible with air or rail operations. At this time, the second phase of preliminary engineering is nearing completion to be followed with advanced structural engineering and further project development. Additional funding is needed to complete a ‘shovel ready’ construction package. The current construction cost estimate for the bridge is ~ $ 15 M.
No public meetings have been scheduled at this time. View of Bridge Model from Warner Rd.